For those of you who celebrated Easter at the weekend I trust you are all back on your diets !! Here in Greece we celebrate at the weekend and am hoping the horrible weather improves. Easter is a time of huge celebration here with families returning to their villages , connecting with old friends and the traditional roasting of lamb on the spit its my favourite time of year ( if the weather is nice ) . There is another new challenge blog on the block Out of a Hat Creations was formed by four blogging friends after a challenge that they participated in every week closed. I was also a regular contributor to the site although in the last few months I had been a bit lackadaisical ! The idea behind their blog is that the four team members, Chrissie, Florence, Sandra and Janet each put ideas for themes in ” the hat ” and each week one is chosen by random. This weeks theme is to use up some of your craft stash. Now before you see my card I just want to point out that although it looks incredibly simple it has taken me four whole days to complete !! Yes four !!! 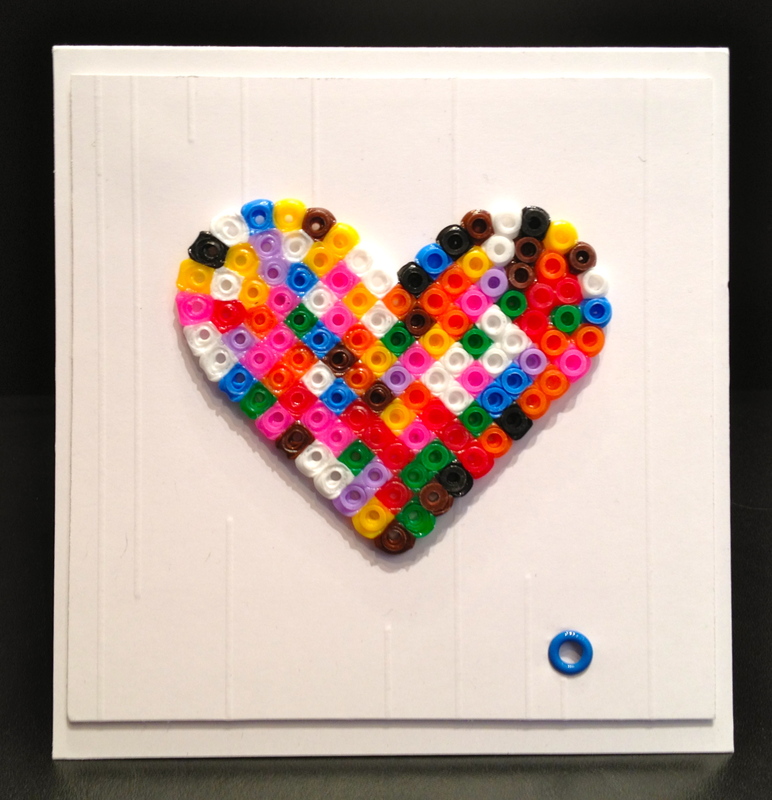 The heart is made from fused plastic beads, the beads are tiny and are placed onto a small plastic base with little tiny pegs that protrude. You place the beads on top in the desired shape and the using a heat-resistant paper iron the top and the plastic fuses together. Ok so far so good ! Not if you are me , the slightest movement of the base dislodges the beads and you have to start all over again or in my case, again and again and ……………….After many many attempts I finally got to the ironing stage but alas the wire from the iron touched the base and they went flying all over the place ! Bailey and Rosy thought this was a great game trying to eat the plastic perishers , I am very sure they are not approved by the canine association ! So out came the Hoover and I started all over again. Near to tears I eventually yesterday evening after twelve hours of work at my shop shakily added the last bead….. and success !!! which is why the card base is so simple I just didn’t have the will to do anything else except for a bit of embossing !! 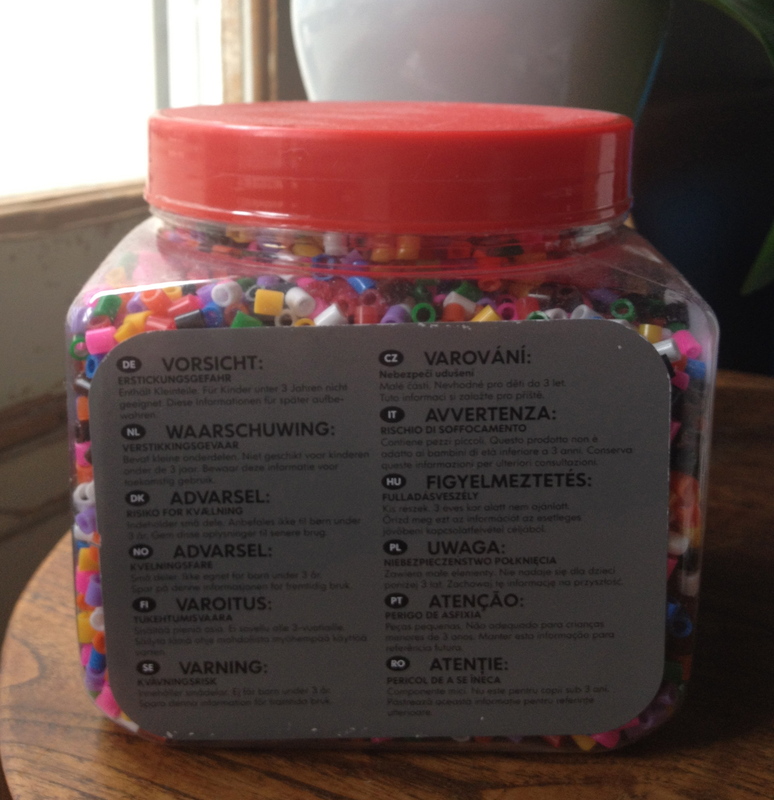 This is a picture of the offending jar of beads which is from a well-known Swedish super store and is supposedly for children !! Now I know why it has been sitting on the top of the wardrobe for over a year and its gone right back up there !! Do pop over to Out of a Hat Creations and support these lovely and talented ladies . Would also like to link this to Use It Tuesdays who are also asking for us to use something from our stash think this fits the bill !! One more thing, a few of you have been unable to leave comments not being able to find where to leave them. With Blogger we are used to seeing the comment form at the bottom of the page but of course the blog theme I chose with WP doesn’t have that facility., trust me ! If you take a peep at the top of the post on the right hand side you will see a little bubble, click on that, or the post title and the form will come up.